It’s that time of year where everyone is swimming in a sea of zucchini, giving it away, making zucchini bread, zucchini side dishes, and now this, Zucchini Herb Fritters with Chipotle Buttermilk Sauce! It’s a great place to be, flooded with zucchini right?!! No complaints here, I’ll take more and more. Grill it, grate it, make fritters. They are so super easy to put together for a quick dinner side or appetizer. I’ve made these dozens of times, and it’s tough to get them to a plate to share before I’ve gotten to them. I usually don’t double the batch though, just because they lose their crispiness so quickly that I like a quick small batch to keep that freshness. So for sure do not make them for leftovers! 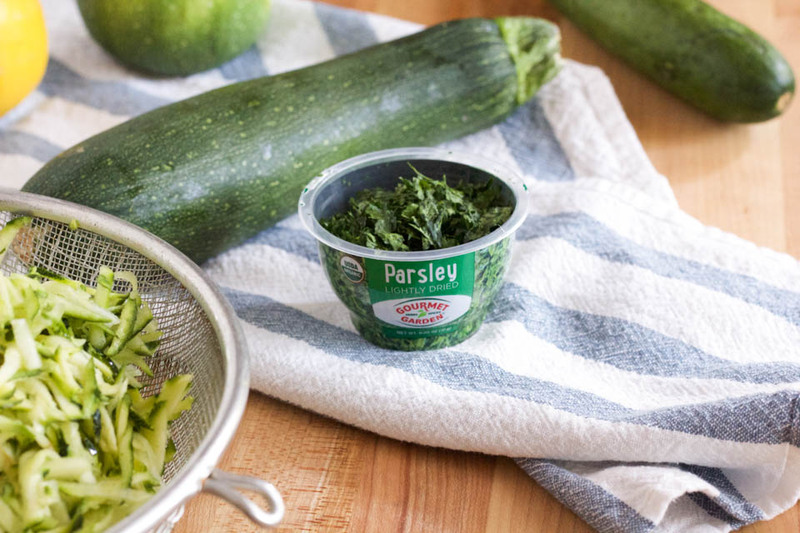 Make them to enjoy fresh and soak in that Summer zucchini goodness with the freshness of the lightly dried perfect parsley. 1. 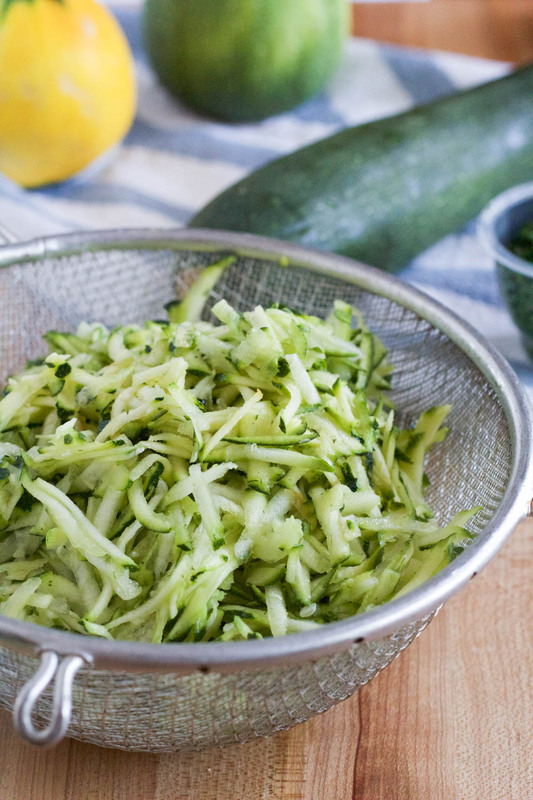 After grading the zucchini, place in a colander or mesh sieve to drain as much liquid as possible. This is the trick to crispy fritters. Sprinkle vegetables with 1 teaspoon fine sea salt, mix to combine. Allow to drain for 1 hour. While vegetables are draining, make the chipotle buttermilk sauce. 2. Place buttermilk, lime juice,parsley, chipotle powder, and salt in a small bowl, mix to combine. Taste for seasoning, add salt and pepper if needed, stir to combine. 3. Place onions, eggs, parsley, salt, and pepper in a medium bowl. Squeeze vegetables once more in a paper towel, to remove excess liquid, add to egg mixture, gently mix together with a spatula to combine. Add flour to mixture, gently combine using spatula. 4. Heat oil in a large skillet over medium high heat. Using a 1/4 cup measure, place 2-3 fritters in pan at a time, do not over crowd the pan. Cook 2-3 minutes on each side, or until golden brown and crispy. Remove and place on a wire rack to drain, or a paper towel lined plate. Serve immediately with chipotle buttermilk sauce. These are not as good for leftovers, they do not remain crispy. These fritters look so wonderful, and the deliciously inventive, creamy buttermilk sauce really puts them over the top! Perfect solution for the “sea of zucchini” 😀 problem! 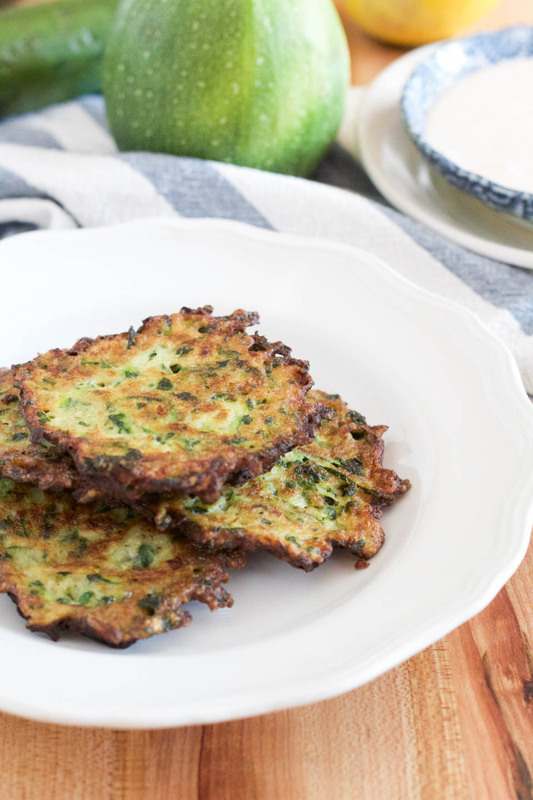 We love zucchini fritters for a light summer meal. All one needs is a salad on the side and that buttermilk sauce sounds perfect! I love it for dinner with a salad! Thank you! A perfect use-up for all the zucchini currently growing in my garden :)! I just love that lightly dried line! It’s so fresh and the fritters sound delicious! I’d be gobbling them right up. I love that lightly dried parsley! What a great idea. Your fritters look so good too! 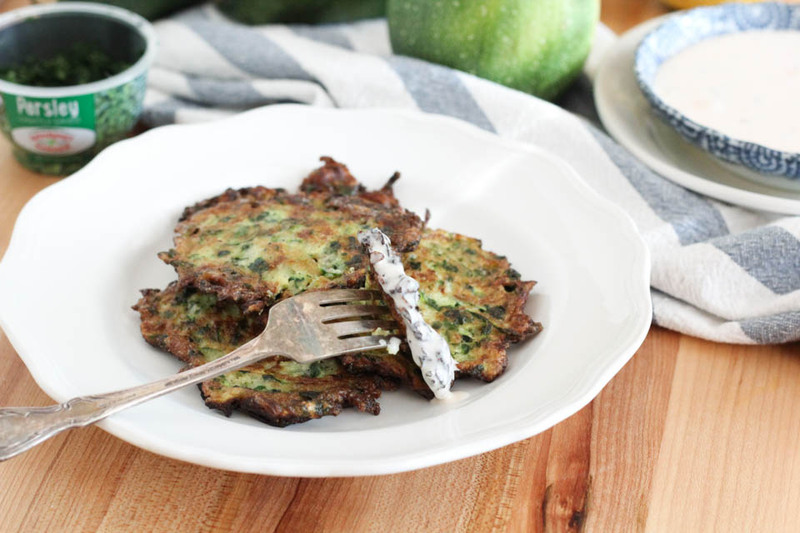 I love zucchini fritters…Especially since I’ve got an over-abundance of zucchini right now! I love zucchini fritters, in fact it’s my favorite way to eat zucchini! Love the sound of the chipotle buttermilk sauce! Oooh that sauce! Sounds to die for! Can’t believe I still haven’t made zucchini fritters, I really need to! Thank you so much, I love buttermilk! Fritters are the perfect way to use up all that zucchini right now. Love the dried parsley because my pot outside with it is dying a slow death in this late summer heat! Right?!! Mine too, makes it so convenient. I can’t wait to try these…they look wonderful! And I have lots of zucchini right now! MMm a great way to use up a glut of courgettes! This is such a great way to eat as much fresh summer zucchini as possible! And that buttermilk sauce sounds fantastic. Yay!